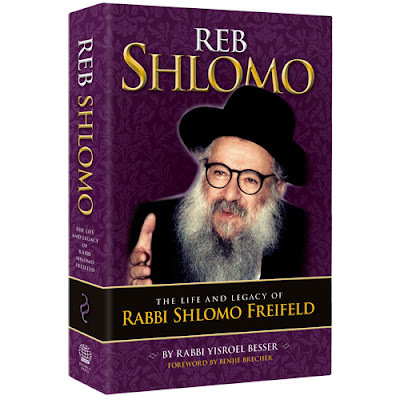 A brand-new book about the life of my Rosh Yeshiva, Reb Shlomo - The life and legacy of Rabbi Shlomo Freifeld, by R. Yisroel Besser, will be available in Jewish bookstores this Friday morning. He was called "Reb Shlomo." An erudite, learned scholar and a passionate, eloquent speaker. A wise and trusted advisor, and a master listener. But most of all, he was a rebbe. He taught generations of talmidim how to live and grow, and revealed a Yiddishkeit full of joy and fulfillment. The special way he looked at people - seeing the greatness in them before they ever saw it themselves - taught them to see the brilliance and splendor of their own neshamos [souls]. This book will bring you into the glorious world of Reb Shlomo. It will touch your heart and stimulate your intellect. You will see - up close - the rich colors with which this master artist painted the human soul. And here is a brief excerpt. And what Hashagacha Pratis [Divine Providence] it is! I have been commenting on various blogs about the recent conversion controversy here in Eretz Yisrael. And what a better support for my position [see my emphasis below] than my own Rosh Yeshiva’s words! Baruch she'kivanti – thank G-d for leading me to the right path! He never lost sight of his primary goal - to teach his talmidim to be people whose Torah learning showed in all their actions. Thus, he never lost an opportunity to teach them sensitivity to the feelings of others. A talmid related how at the conclusion of the chupa at his chasuna [wedding], he immediately approached his rebbe to give him a kiss. His simcha [joyous occasion] was at its peak, and he wanted to share the special moment with the one who had orchestrated his growth. Reb Shlomo was smiling broadly, and had these words to share: "Go back and kiss your mother first." There was a term that he used, "the implications of Halacha," with which he referred to ideas that weren’t actual Halacha, but a sensitivity that one who is in touch with Halacha develops. Reb Shlomo once noticed a family member saying Kriyas Shema, sitting with their legs crossed. He smiled gently. "Do you know what the difference is between the Mona Lisa and all the imitations? That extra little bit, the extra brushstroke of the artist that is the difference between perfection and imperfection. Kabbalas ol malchus Shamayim, accepting the yoke of Heaven, should be perfect." Was he in Far Rockaway? If so, he was the rabbi asked about velcro in 1969 or 1970. It was brand new at the time and we didn't know if it could be used in our NCSY dance prop on Shabbat. Nowadays velcro is used by lots of people for all sorts of things on Shabbat. Someone once promised to get a clarification and didn't. I'm still concerned. Awesome! I heard so many wonderful things about him from my friend's father, who was one of his talmidim. It's about time someone put together a book. My father-in-law learned with Rabbi Friefeld and he mentioned how he understood each talmud on his own level in a way few could. Truly a great man and Torah Scholar. Great post. There is also a very nice chapter about him in the Artscroll book "Warmed by Their Fire".